Grand Prize Winning App | Think.Design.Code. In late spring of 2013, I attended a presentation about the new BlackBerry devices, the Z10 and Q10, and operating system, BB10, and rather spontaneously decided to develop a mobile application for a contest announced at the event. Essentially, my thoughts were, “Why not?” Roping in a good friend, we spent just over a week learning, coding, designing, and testing our app. Provided that the application met specific guidelines regarding functionality and user experience, it was eligible for the contest and certified “Built for BlackBerry.” Then, BlackBerry selected one qualified app from each participating school to compete for the grand prize at their North American conference in Orlando, FL. There, a panel of venture capitalists selected the app they believed to have the most potential. 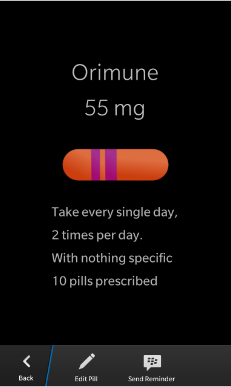 and half, we successfully submitted a medication tracking app, convenient for remembering how to take a certain medication (ex: with or without food) and for setting reminders in the device’s native calendar app. After being selected to enter the final round, we traveled to Orlando for an incredible weekend.